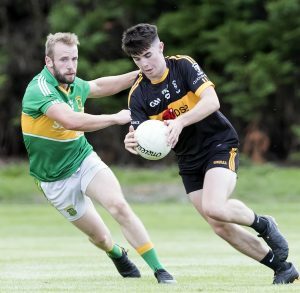 SOME of the group winners have already been decided in the Pittman Traffic & Safety Intermediate Football Championship but as the last round of group games get underway, Ger McNally looks over how things could play out. THE game between Ballyteague and St Kevins should be the game of the weekend in the Intermediate Championship. St Kevins would be a lot of people’s favourites to lift the title but they laboured to a one point win over Rathangan last time out. Ballyteague are slowly developing from dark horses to genuine contenders and a win here would absolutely confirm that. 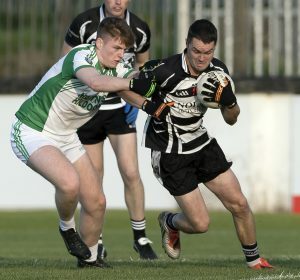 Jimmy Hyland has picked up where he left off after a sensational year for the Kildare U20s and the Larks could be the ones singing at full time if he hits his stride once again. Rathangan and Straffan meet in the other game to decide third place. Rathangan pushed Kevins hard last weekend and have a lot of good young players which might just give them the edge over Straffan. TWO Mile House have been a cut above the rest so far in Group B and there is no reason to think that things will be any different when they take on Sallins on Thursday evening but while top spot is assured for Niall Browne’s team, there is a real scrap just below them. If the ‘House, as expected, they make it three wins from three that puts even more significance on the local derby between Ellistown and Monasterevan. Ellistown need to beat Monasterevan to have any chance of prolonging their Championship but even if they do, the size of their defeat to Two Mile House is likely to count against them when it comes to score difference. Monasterevan will see this as a great chance to bag local bragging rights as well as securing second spot in the table. 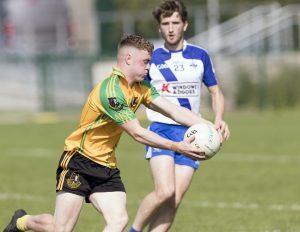 JACK Robinson back on form means that Clogherinkoe are in the select group of teams who have real prospects of winning an Intermediate title and they are definitely not a side that Allenwood will be relish facing in their current predicament. 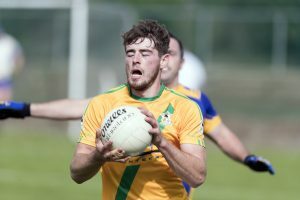 After relegation from the Senior Championship last year, Allenwood now find themselves in a relegation play off for a second successive season. They should have enough about them to avoid the drop but at the same time, anybody in that bottom four could easily slip through the trapdoor. They are unlikely to find any cheer against Ronan Quinn’s Clogherinkoe. That leaves Kilcock and Suncroft to sort out between themselves who will finish in second and third place with last year’s runners up Kilcock showing enough of an upturn in form to suggest they will come out on top. KILCULLEN find themselves in the quarter-final with a game to spare and their game against Ballymore is a dead rubber. The winners of the last two Junior Championships meet in a game that holds no significance in terms of the result but both teams will be hopeful of a win to boost their hopes for more important games to come. Nurney verus Kill in the other game is likely to be a real dogfight but Nurney’s strength and experience should be enough to get them the even if the suspicion is that Kill carry a slightly better scoring threat. Round 2: Kilcullen 1-7 Nurney 0-9, Kill 2-9 Ballymore Eustace 0-11.